Crowning a promontory overlooking Laguna Beach, this exotic estate runs the gamut in resort-style comforts. Contemporary interiors dressed in notes of Bali style appeal to a wide palette, with chef’s and catering kitchens, a glassed-in wine cellar and a professional recording studio. Explosive ocean views form the backdrop for a saline swimming pool and a swim-up bar, furthering what some might call a five-star experience. The 10,200-square-foot home in Laguna Beach features two kitchens, a professional recording studio and a wine cellar/tasting room. A resort-style swimming pool complete with a swim-up bar and 10-person spa highlights the grounds. Soaring over Laguna Beach on its own promontory, this contemporary estate encompasses approximately 10,200 square feet of living space and sits on nearly one acre, leaving room to build a guest home. Inspired by luxury 5-star island resorts, this truly magnificent home offers an indoor-outdoor open floor plan and unrivaled panoramic ocean and canyon views from virtually every room. The entire home is showcased with custom designer details. The Foyer boasts white limestone imported from Paraguay, with a custom sculptural light fixture. A glass enclosed wine room has capacity for 1000 bottles with an anti humidity cooling system. Floor to ceiling automated pocket doors open to the outdoors in both the living and dining area, with walnut wood-beam ceiling detail. The bar area includes multiple TVs, custom retractable windows leading to the outdoor dining area, holds a Perlick 3 spigot beer tap, wine cooler, bar refrigerator, and lighted glass display. The main level guest suite and bath hosts a private entrance and ocean view from bed, along with switchable privacy glass. An oversized island in the kitchen is accompanied by a Wolf Double wall oven, Fischer&Paykel Double Dishwasher drawer, and a built in butcher block. A separate catering kitchen holds a Bosch dishwasher, Capital Range, and Wolf warming drawer; all leading to the service hallway connecting to dining room. The grand staircase of glass, polished steel and walnut wood leads to the media room with surround sound and built in beverage bar and bar refrigerator. A private foyer opens to the master suite, which includes an In-suite office with wet bar and refrigerator, TV/video projection with automated drop-down screen and automated blinds. The private balcony hosts unobstructed 180 degree ocean views. In addition, all secondary bedrooms have their own private ocean view balcony. For easy access to the upper level, don’t miss the designer glass elevator. The serene, tropical resort ambiance transitions seamlessly to the outdoors with amenities including a custom saline pool with swim-up bar, 10-person spa, large entertaining cabana, and pool house with shower/steam room, making this the ultimate entertaining compound. The private, gated entry and driveway leads to the 7-car garage with turn around to accommodate 8 additional vehicles. The home is ideally located above The Village in Laguna Beach, displaying continually breathtaking views, including glowing city lights after dusk. Art galleries are scattered throughout the tight-knit community, supporting local and international artists alike. The city hosts The Pageant of the Masters and The Festival of Arts annually. It is also home to some of the worlds best hotels, including The Montage Laguna Beach, and is a short distance from The Ritz Carlton Laguna Niguel and The St. Regis Monarch Beach. Local beaches, boutiques, and coffee shops create a beautifully unique landscape. Did your child’s high school rank among best in U.S. News & World Report? 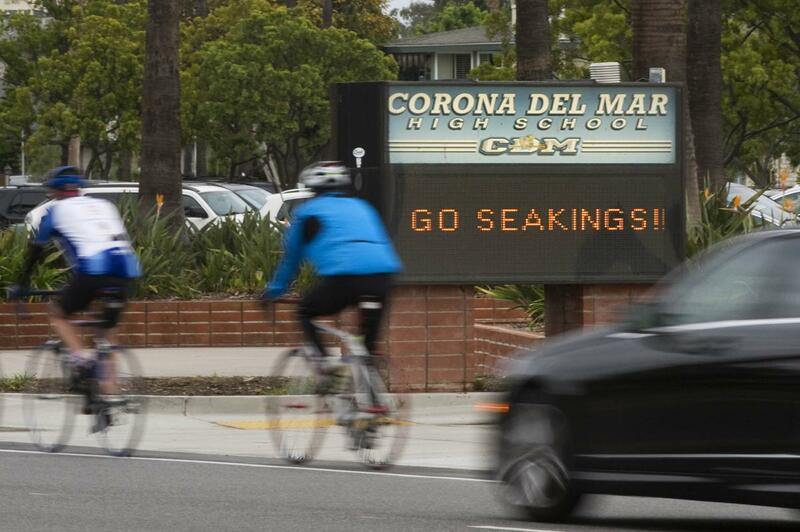 Corona del Mar High School ranked as the 40th best public high school in California in U.S. News & World Report’s rankings released this week. Three schools in Irvine cracked the top 100 statewide again this year: University High at 46, Northwood High, at 68, and Beckman High, at 74. University and Northwood are in the Irvine Unified School District, and Beckman is in the Tustin Unified School District. Troy High School in Fullerton came in 69th – up from its 97th spot last year. Orange County School of Arts, in Santa Ana, placed 72nd in the state, four paces ahead of its No. 76 ranking last year. Noticeable in its absence was Oxford Academy in Cypress, a magnet school that has consistently ranked among the top schools in the state and even in the nation for the past decade. “We believe there was some kind of glitch,” said Michael Matsuda, superintendent for the Anaheim Union High School District. There were no drops at Oxford in any of the metrics the magazine considers, and in some cases, Oxford ranked even higher, Matsuda said. Last year, the school was second best in the state, and 16th best in the nation. U.S. News was unable to compute the school’s college-readiness index because Common Core data collected by the U.S. Department of Education’s National Center for Education Statistics did not include necessary information, such as grade 12 enrollment numbers, said Robert Morse, chief data strategist at U.S. News. Other Anaheim Union districts schools that typically garner silver and bronze medals got none this year and according to the rankings, some of the data also appears to be missing from the magazine rankings published online, said Manuel Colón, the district’s chief academic officer. Only two of Anaheim Union district’s high schools netted a silver medal: Kennedy, ranked 298 in the state, and Cypress, ranked 236. No Orange County school ranked among the top 100 nationally. Whitney High School in neighboring Cerritos ranked top in the state and 19th best in the country. Another area school that ranked high was the California Math and Science Academy, part of the Long Beach Unified School District, which came in as 10th best school in the state. The magazine evaluated nearly 20,000 schools in 50 states and the District of Columbia. Analysts looked at various measures, including whether each school’s students were performing better than statistically expected for students in that state and whether disadvantaged students – black, Hispanic and low-income – were outperforming disadvantaged students in the state. Another consideration was how well schools prepare students for college, based on scores of Advanced Placement or International Baccalaureate exams. For the first time, graduation rates were added as a measure. Orange County’s spring homebuying season rocketed into high gear last month, with prices and sales already outdistancing last year’s buying frenzy, figures released Monday show. The median price of an Orange County home – or the sale price at the midpoint of all transactions – was $625,000 in the year ending in March. That’s up 6.8 percent and within $20,000 of the all-time high reached at the peak of the housing bubble in June 2007, Irvine-based data firm CoreLogic reported. If prices continue going up at a rate of 4 percent or more, the median will surpass the bubble’s high-water mark by June. Sales, meanwhile, ticked up to the highest level in a decade for the month of March. CoreLogic reported 3,181 transactions closed last month. While that’s up just a 0.8 percent from a year ago, it’s still the highest March tally since 2006. Home prices have risen steadily for four straight years in Orange County and in Southern California as a whole, with the Orange County median climbing $225,000 since March 2012. First-quarter inventory was at the lowest level in three years, increasing competition among buyers, according to Steve Thomas’ ReportsOnHousing.com. The bottom line: It’s more fun right now to be a seller than a buyer. Erin and Owen Campbell have seen the market from both sides, as both sellers and buyers. The family of eight decided to sell the cramped century-old Craftsman they owned in Orange and move into roomier digs closer to their children’s school in Costa Mesa. Being a seller was far easier than being a buyer, Erin Campbell said. Buying was a bit trickier because there were so few homes for sale in the neighborhood where the family was looking. “The one that we ended up buying, the listing price sounded reasonable, but we didn’t have anything to compare it to,” Erin Campbell said. Both sales closed in March. And selling with just one showing and no open houses made it extremely easy. “It’s hard to have a tiny house with six kids with a lot of showings,” Erin Campbell said. Some homesellers may be attempting to exploit their advantage by overreaching in setting their asking prices, said Kamenca, the Huntington Beach broker-associate at Re/Max. He noted that out of more than 900 recently listed homes, 500 had lowered their prices. CoreLogic analyst Andrew LePage noted that the market still remains somewhat constrained. “Many would-be buyers continue to face hurdles such as waning affordability, moderately tight credit and a relatively tight inventory of homes for sale,” LePage said in a prepared statement. But, he added, “the new-home market has registered a stronger heartbeat.” New-home sales jumped 26.5 percent in Orange County year-over-year last month and increased 25 percent during the first three months of the year. Market watcher Steve Thomas reported the number of homes for sale finally reached 2015 levels by the first week of April – too late to affect March numbers. But demand rose accordingly. The time needed to sell all Orange County listings fell to less than two months in late March, Thomas reported. And for homes priced at $750,000 and below, the listings could all be sold in 37 days at the current buying pace. Larry Roberts, an author and real estate blogger-turned-broker, wrote Monday that low mortgage rates and an improving economy are boosting both home sales and prices. Freddie Mac reported Thursday that the average rate for a 30-year fixed mortgage fell to a three-year low. “As long as mortgage rates remain low, I expect house prices to continue rising and sales will be strong,” Roberts wrote. 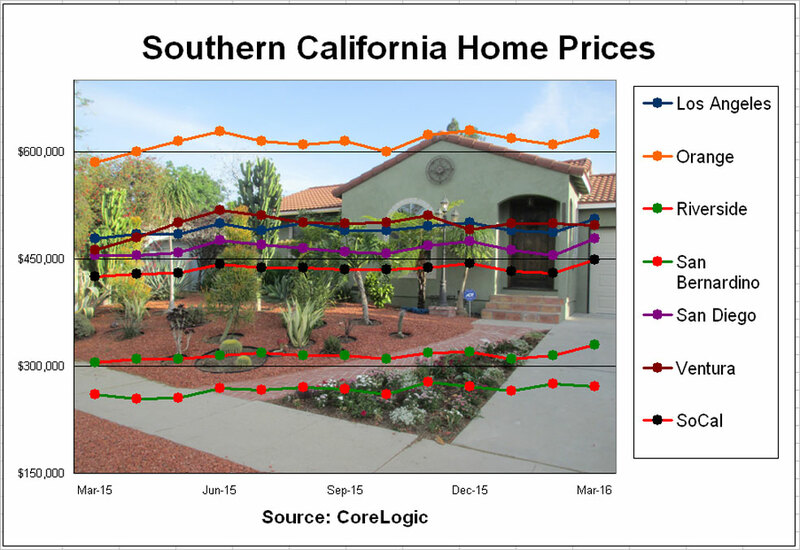 In Southern California as a whole, the median home price rose 5.6 percent to $449,000, the region’s highest median in 8½ years, CoreLogic figures show. Home prices in the six-county area are $56,000 below the all-time high of $505,000. CoreLogic reported 20,370 homes sold in the region, up 1.9 percent from 2015 and the most for a March since 2013. Prices were up in all six counties, with Riverside posting the region’s biggest price surge: up 8.2 percent to $330,000. Sales rose everywhere but Los Angeles County, which had a 1.4 percent drop from 2015 levels. The biggest sales gain occurred in San Bernardino County, where transactions jumped 7.7 percent. Buyer Carie Murphy said many of the properties she was looking at had multiple offers already, and she wanted to steer clear of a bidding war. She ended up buying a two-story townhome in Anaheim, with a two-car garage in a complex with a pool, spa and tennis courts.